Tru-Fit Carpets is an Australian Supplier of Car Mats. Tru-Fit Carpets has been manufacturing car mats and other automotive accessories for over 30 years. Located in Dandenong, Victoria, Australia (a suburb of Melbourne) Tru-Fit makes custom car floor mats, 3D mats, molded vinyl flooring, cargo liners and floor padding/insulation. The company sells into both the Australian and international markets via their website and their eBay store. Tru-Fit Carpets Carpeted CarMats are Made in Australia and Sold Worldwide via Tru-Fits Website and their eBay Store. 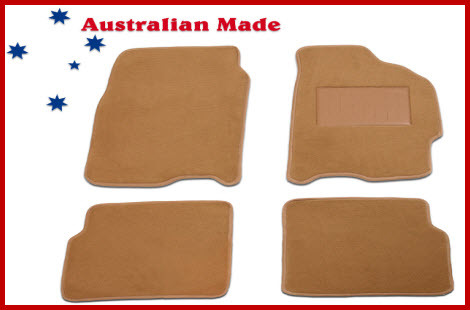 Tru-Fit says their car mats are made from high quality Australian made automotive carpet. They take the carpet, add a heel pad on the drivers side, back the carpet with a heavy underlay, then glue on a non-slip backing to prevent mat slippage. The edge of the mats are bound with a colour match binding unless you specify a contrasting or alternate colour.Three different piles are available; loop, cut and replica loop. You get to pick from a palette of 14 colours for the loop and cut piles, and from 9 colours with the replica loop pile. Tru-Fit Carpets also makes what some in the industry refer to as 3D Car Mats. You may know them better as car floor liners. The Tru-Fit 3D Car Mat is assembled with a top layer of either TPR Rubberized Vinyl or Polyester Carpet. Tru-Fit Carpets makes 3d Car Floor Mats. 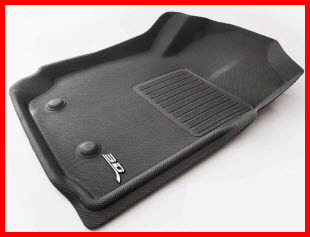 Similar to car floor liners they protect a larger area than a regular car mat. 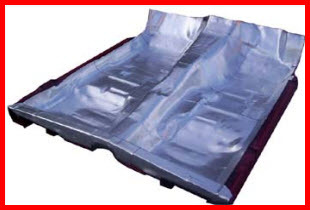 An inner layer of XPE is attached for sound deadening, water resistance and to soften the floor under your tootsies. Finally a patented backing fabric is attached to grip your vehicles carpet and prevent the 3D Mat from slipping. Grommets are available for some models to match up with the mat retention system already in use in your car. Each of these mats is made to custom fit your vehicle and features a raised lip around the edge to trap liquids, dirt and gunk. The 3D Mat is pretty stiff so you can remove it from the car and shake it off or hose it down to clean it. For those of you into the vehicle restoration scene, Tru-Fit Carpets makes replacement moulded vinyl flooring for a wide range of cars, pickups, 4x4's, trucks and more. Each piece of replacement flooring is custom heat moulded to fit the shape of your vehicles floor pan. You may have to trim some edges and cut some holes to get an exact fit during installation of this product in your vehicle. The vinyl is available in black, grey and brown colours. You may also purchase the vinyl flooring unmoulded in various lengths of 1.5 meter wide pieces for your own custom project. Tru-Fit Carpets makes a great cargo liner, the Tru-Liner, that goes above and beyond the call of duty of a regular cargo liner. Besides protecting the rear cargo area in your SUV, 4x4 or station wagon, it also protects the rear of the back seat. Just where the kids like to kick their muddy feet when you've exiled them to the back of your previously clean vehicle. You can roll the liner up against the rear seat when it's not in use and it has Tru-Fits patented non-slip backing to help hold this great cargo mat in place. These mats are available in beige, black and grey. Hood Bonnets are those pieces of tattered, black, felt like material hanging from the underneath of your hood when you pop it open. Originally, this stuff was used to deaden engine noises but lately you've noticed the roar from up front a little more. That means you need to replace the hood bonnet. It doesn't take long. Tru-Fit has pre-moulded and cut to size a new hood bonnet for your vehicle. They also give you clips that fit the factory holes the old hood bonnet used. What could be easier. They only come in black - I mean, who is going to see them anyway! And your ears will thank you. Floor Padding or Underlay made of heavy felt is a great way to enhance the quality of your carpet replacement job. Tru-Fit provides large pieces of heavy duty felt (920mm x 1750mm approx) to do this job. You can easily cut the felt and it's flexible enough to fit almost any space or corner. It cushions your carpet so your feet like the feel, and it also acts as a thermal barrier to keep your feet warm or cool depending on the season. Tru-Fit Resomat Sound Deadener on the Floor Decreases Noise and Vibration Throughout the Vehicle. 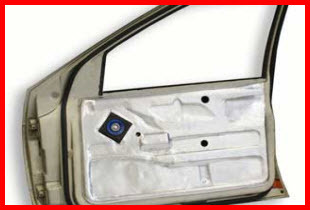 Tru-Fit Resomat Sound Deadener on the Door Decreases Noise and Vibration Throughout the Vehicle. Resomat Sound Deadener makes your car as quiet as any prestige vehicle, or so says Tru-Fit. 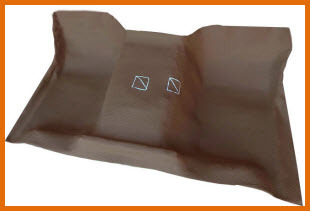 Used by BMW, Mercedes, Audi and a bunch of other fancy car manufacturers the Resomat product from Tru-Fit is a sound deadener or acoustic dampener made from German engineered, new generation polymer materials that have been faced with foil and backed with a pressure sensitive self adhesive for easy application. It's extremely flexible and doesn't require the use of a heat gun to make it conform to the odd shapes or surfaces you may find in your vehicle. It doesn't smell, harden or become brittle. While it's designed to reduce the vibration and sound transmission in thin gauge metals and plastic panels you may also find it reduces the tinny, ringing in your ears, everytime you ride in the car.